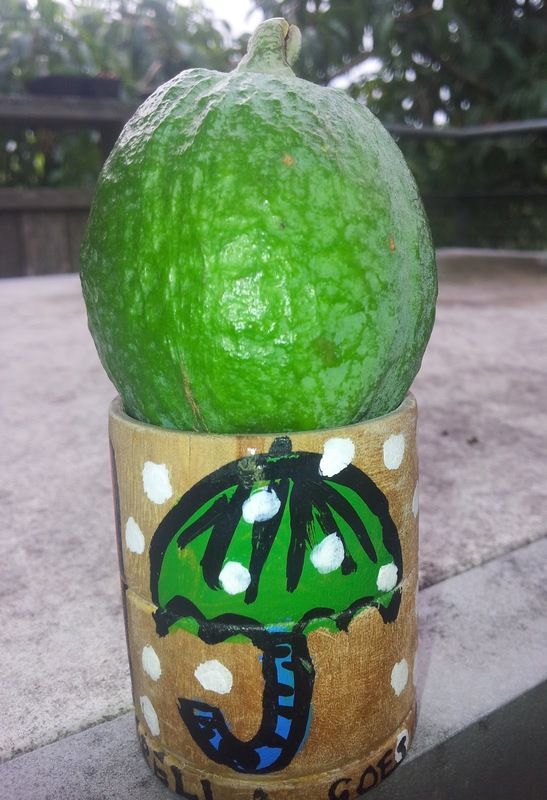 Jeannie's Kitchen: It's raining Feijoa! The drought in Auckland has broken. Not only rain is falling in our suburban garden it's also raining feijoa. What a treat for a southerner! 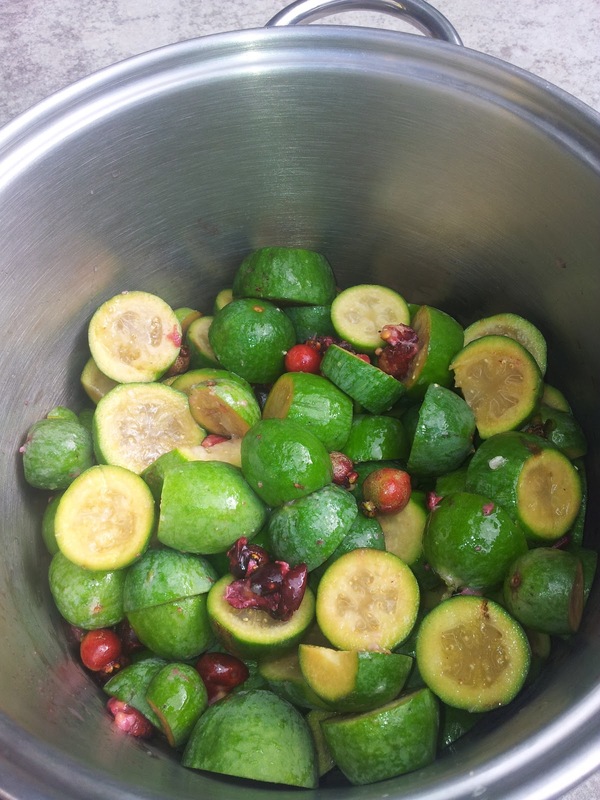 Feijoa is perfumed, sweet and a tart fruit all in one. To ensure the fruit is at its maximum flavour you need to wait until they fall, but this does mean they only last for a precious few days once they hit the ground. Feijoa do bruise so you need to handle them as you would a peach. The best way to eat a feijoa is raw, cut in half and scooped out with a spoon. 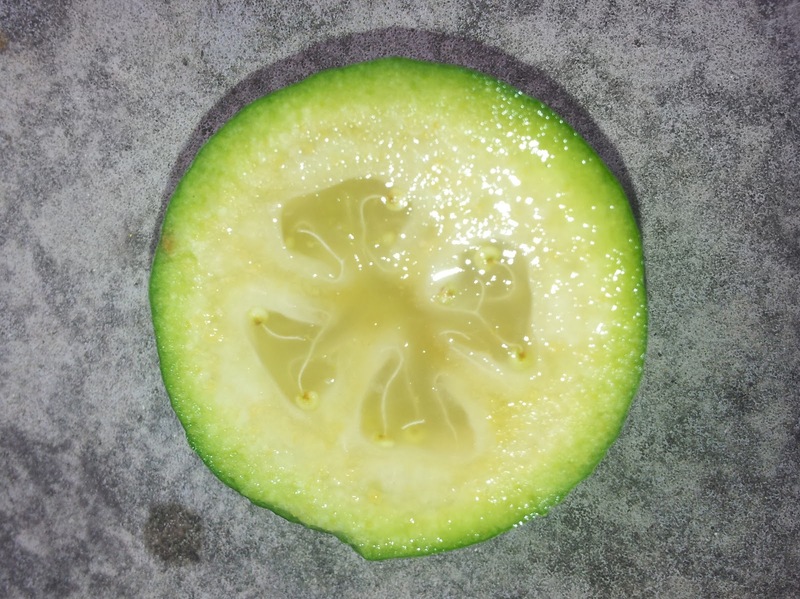 The juicy sweet seed centre is a different texture to the outer part of the fruit. The outer edge can be tart and usually has a grainy texture, especially when not at full ripeness. You too may have this fruit in abundance or have been given a bagfull and are looking for fresh ideas on how to use them. 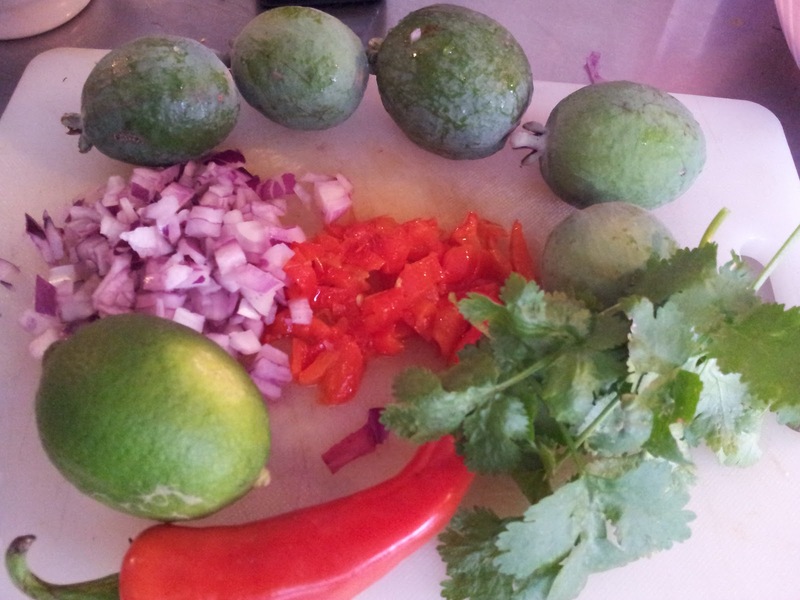 As the Feijoa originates from South America, Salsa is a most appropriate dish to start with. It makes a great starter with bread and crackers or to accompany a main. It works well with chicken or fish. This is something that I put together with what I have in the kitchen. You can use any combination of fruit/vegetables for a salsa. It usually has some heat from chillies, onions or garlic. Always taste as you go to see if it needs more acid, heat or sweetness. 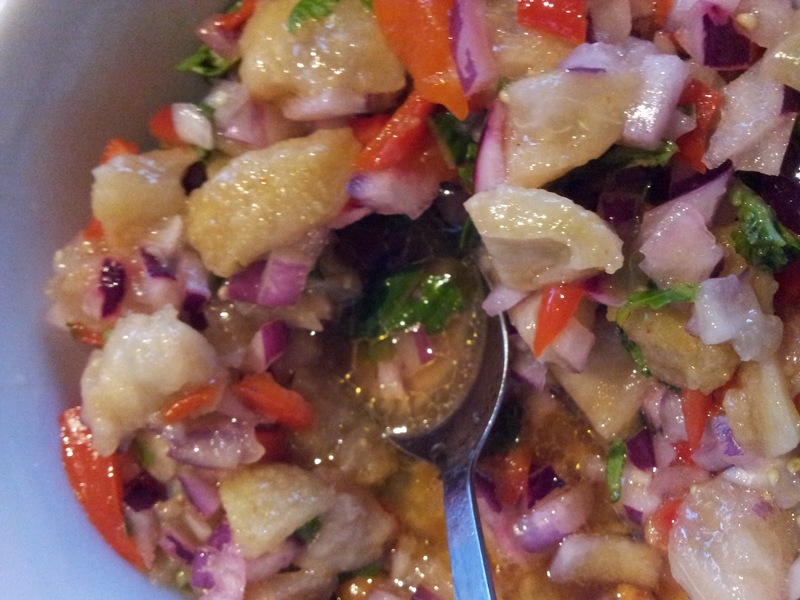 Begin by finely chopping a small red onion or half a large one, a red pepper or a chilli pepper (depending on the heat you want to add to the salsa) and a clove of garlic finely diced. Scoop out the flesh and chop about 6 Feijoas (you can use more or less). To give the salsa a tang, add the juice of a lime or lemon. Decide on the herb flavour you want to use or have on hand. I used coriander. It worked well with Feijoa but you could use basil, tarragon, parsley or mint. The choice is yours. Season with salt and pepper. Add a good slurp of olive or avocado oil. 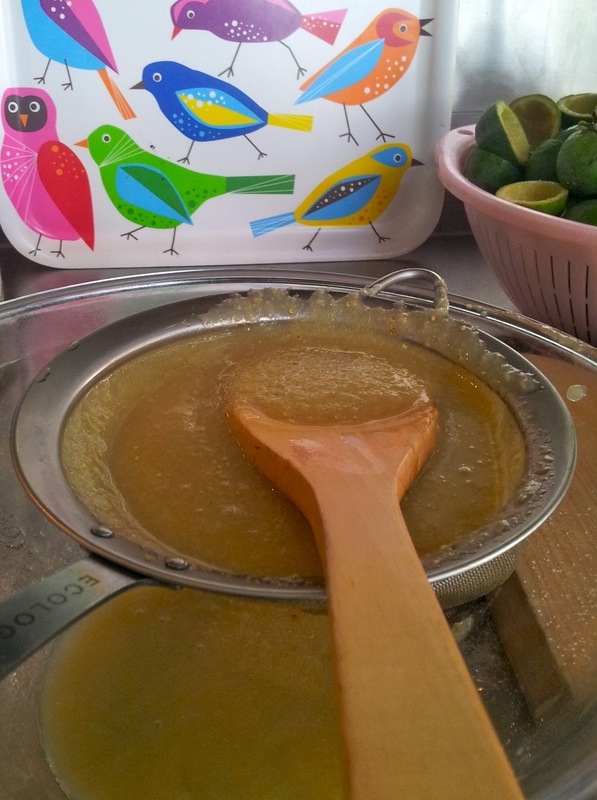 If you feel it needs a little more sweetness add a tsp of honey. 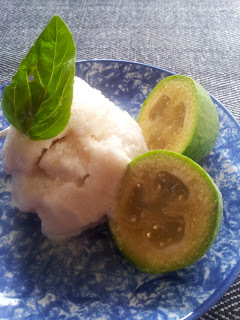 The first time I made sorbet I was rather apprehensive because it seemed so exotic and surely must be difficult. But let me tell you it's so easy...just plan ahead a couple of days to allow for the freezing process. You can even make sorbet easier by using an ice cream machine, but I don't have one and did a perfectly good job with a stick mixer, a recycled ice cream container and the freezer. excellent light dessert after a filling main course. This is a mix of two recipes I found. One using egg white and the other using ginger beer. In the Sorbet world there is a debate over whether you should add egg white or not, as some feel the egg white can flatten the flavour of the fruit. My home kitchen taste panel voted the egg white version the best for Feijoa because it produced a sorbet more like a gelato ice cream. 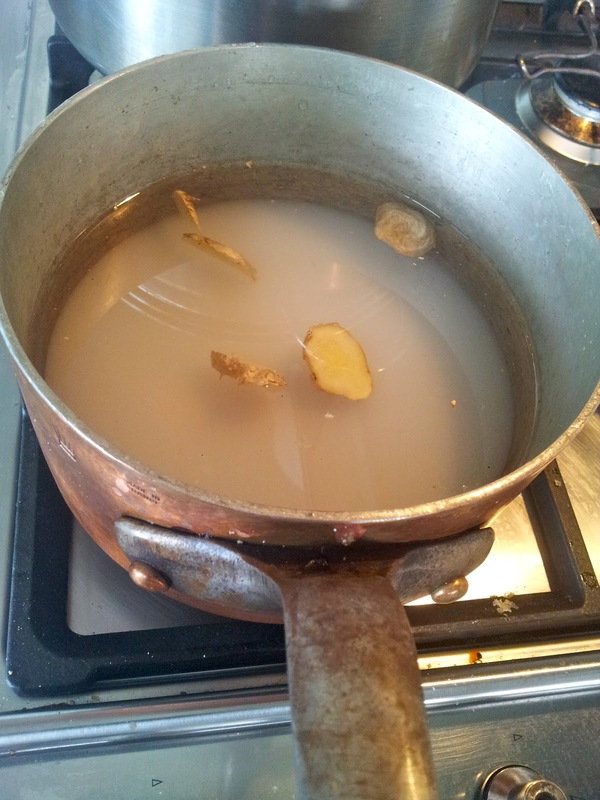 First bring the sugar, water and ginger to the boil for 3-4 minutes. Turn off and allow to cool slightly. While the syrup is cooking and cooling, puree the scooped Feijoa flesh. To make 250 ml of pulp that is strained you will need to make about one quarter to a third more puree as the grainy flesh stays behind in the sieving process. 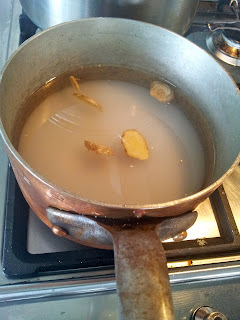 Take out the ginger and add the sieved puree to the syrup. I know its a lot of sugar but you do need sugar to keep it soft. Alternatively if you add alcohol, then you can reduce the sugar. If a sorbet is too soft it means you have too much sugar, not enough sugar and your sorbet will be ice. Next fold in stiffly beaten egg white... easier said than done!? The first time I tried this recipe it was for a dinner party and I thought I had a disaster on my hands at this stage of the process. The egg white just floated. I tipped it into my ice cream container, put it in the freezer in the hope that when I got it out the next morning the egg white would behave. and right is the finished sorbet to go back in the freezer. Next morning my fears vanished. 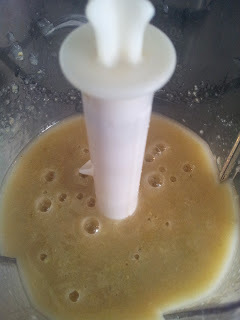 Once I whizzed up the frozen slush with a stick blender the egg white became part of the sorbet making it light, smooth and even creamy. Ideally, you do this process at least one more time before serving. The sorbet was a big hit. I served it with halved Feijoa, limoncello and a basil leaf. 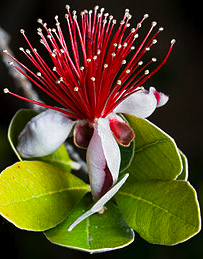 We kiwis have really taken the Feijoa to our hearts and our gardens since first introduced in the 1920's. Overseas you might see them called Pineapple Guava or Guavasteen. the family resemblance to our native Pohutakawa! You can use the flower stamens in salads and they taste cinnamon-like. I am keen to try this next spring. I don't have particularly fond childhood memories of guavas. Mum would buy tinned guavas as a treat from the tropics. The large pale pink seedy fruits were never very appealing. But I was introduced to the Red Cherry Guava in our garden by friends Jules and Ruud, ex Aucklanders now living in Christchurch. With nostalgia for the flavours of the north they pounced on the few that were ripe and we realised we had a treat ahead for us. The Red Cherry Guava is the size of a marble or a small crab apple. 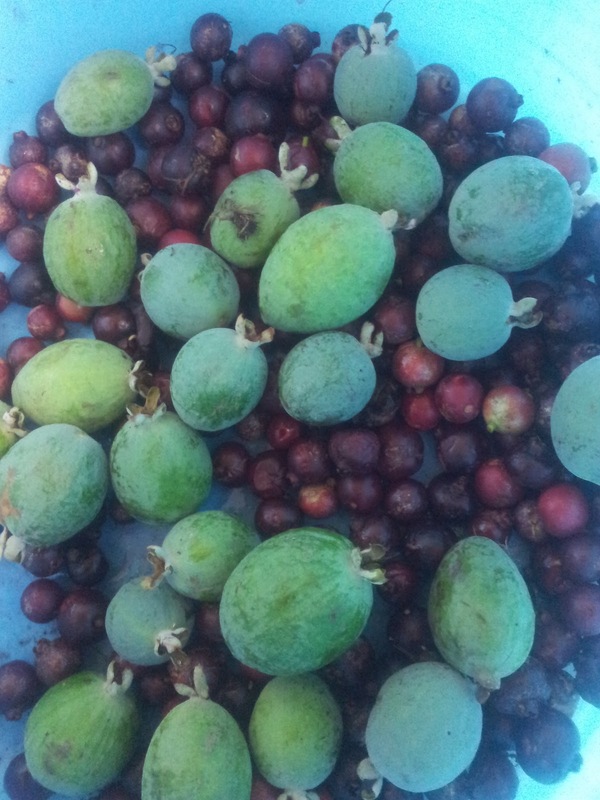 It has a dull red thick skin and like Feijoa they are packed with vitamin C with most of the vitamin C being in the skin. 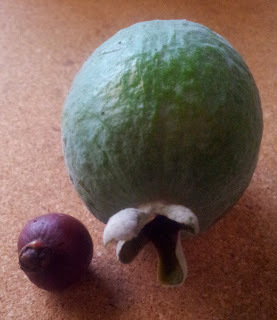 Guavas are related to the Feijoa and have that same perfumed sweet flavour. Down south I would make crab apple or hawthorn and apple jelly. I decided this year I would make a jelly more fitting for Auckland - Feijoa and Guava Jelly. I cut the Feijoas in half to check that the fruit is not too old and to assist in the breakdown of the fruit. I decided to add to the flavour with a cinnamon stick, to reflect the taste of the Feijoa flowers. Barely cover the fruit with water and cook until mushy. 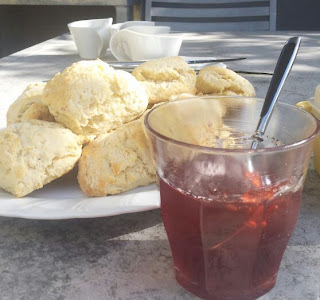 Alison Holst advises for her pink Feijoa Jelly not to squash the fruit. I decided to give the soft fruit a bit of a squash with a potato masher. The one rule in jelly making is "don't squeeze the bag" or your jelly will end up cloudy. 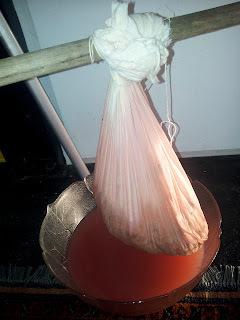 I thought mashing the fruit at the cooking stage may also cloud the jelly.. but then for Rosehip jelly you actually puree the cooked hips in a blender before cooking a second time before going through the jelly bag. to the size of a pillowcase. It's something you will have for years. Once the fruit is soft it's time to extract the liquid to make the jelly. I sit the jelly bag inside a large bowl, pour in the contents of the pot, and slowly lift the bag and tie to a stick or broom handle that sits between to chairs. Leave it hanging for 24 hrs and don't let anyone squeeze the bag! of a nob of butter and a stir after you take it off the heat. Most jelly recipes say one cup of sugar to one cup of liquid. I like my jelly to have a real tang and reducing the sugar even a little is a good thing. I use the same formula as for marmalade. 3/4 cup of sugar to a cup of liquid plus an extra half cup. So for my 11 cups of juice I needed 8 1/4 cups of sugar. I rounded the measurement up to 9 cups of sugar to 11 cups of juice. You do need sugar for preserving and setting so it is a balancing act. Heat the liquid and then add the sugar, stirring until all sugar is dissolved, to avoid sticking on the bottom. 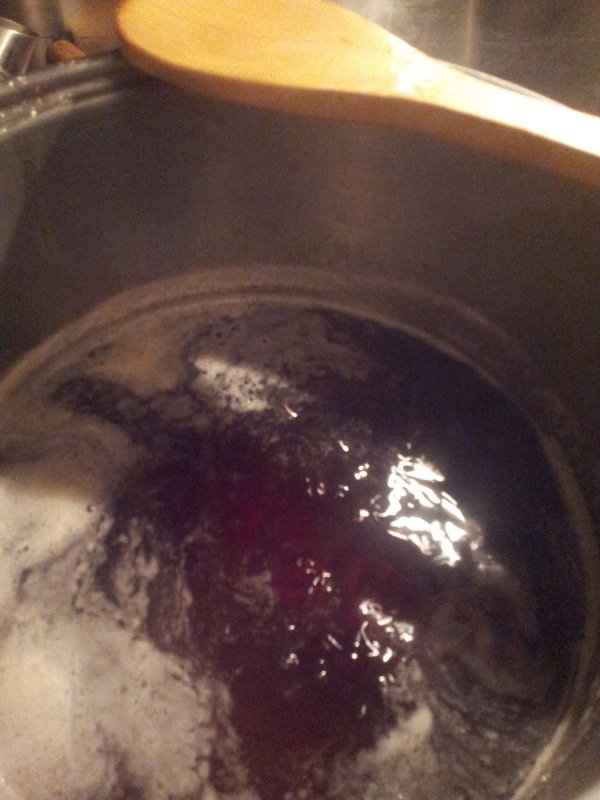 Get the jelly up to a rolling boil and continue to boil until the jelly shows signs of setting. As I was unsure of the pectin content (pectin in fruit ensures the jelly or jam sets) in Feijoa and guava I was preparing myself for the jelly not setting. It seemed like ages it was boiling and it wasn't setting so I added the juice of a lemon. Lemon assists in the setting because it is high in pectin. To test the set I find the best way is to place saucers into the freezer prior to making the jelly and spoon a little onto the really cold plate. If you blow on it and a skin wrinkles on the top or when you push with your finger and the liquid doesnt close up behind, then you have jelly. It's not the end of the world if it doesn't set first time. You just re-boil with added sugar. I wanted a soft set jelly with plenty of wobble. It wasn't setting in the saucer but it was starting to jelly on the wooden spoon so I took a risk and poured it into clean hot jars that I had sterilizing in the oven at 150 degrees. jars cracking that may occur with a contrast of heat on a metal surface. Fill the jars with a small jug and seal. I seal by first putting on a cellophane seal and then put on screw lids from recycled glass jars. 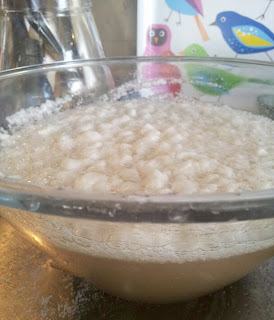 This will avoid evaporation that will occur with cellophane only. I had to wait until the next morning to see if my jelly had set...and yes it had! 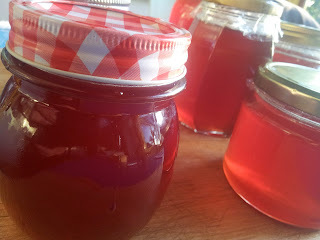 A lovely rich red wobbly jelly. I made a batch of scones for the home taste panel and everyone who partook loved the jelly. 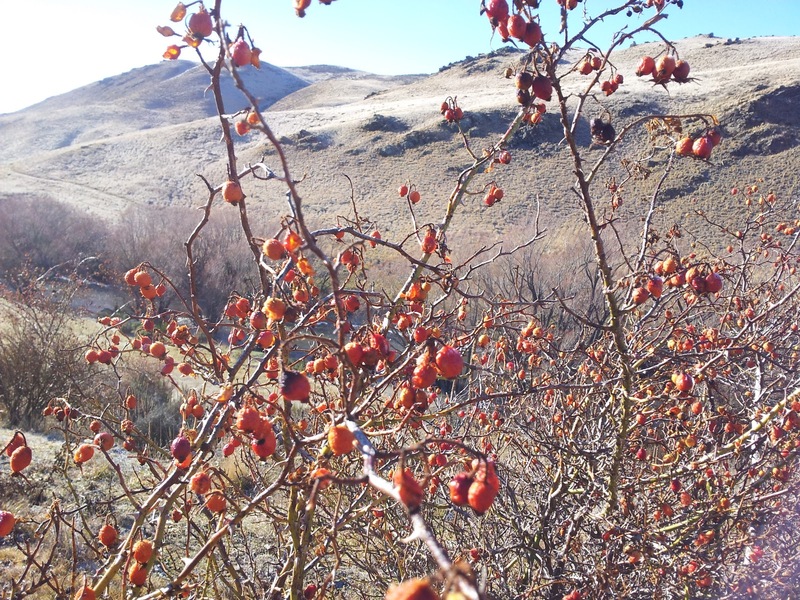 For those of you down south I imagine it will be too late now to make Hawthorn jelly but in Central Otago the rosehips will be ready to pick after a couple of frosts. The frost increases the sweetness of the hips. 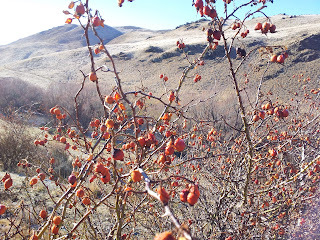 As collecting rosehips is a prickly and time consuming business I suggest adding apples to bulk out the fruit. I am going to share my Feijoa bounty and have packed up a small box with a jar of jelly for my sister Kerry in Dunedin. I will also keep a jar of jelly for Jules and Ruud as a thank you for introducing me to the Red Cherry Guava. The joy about making jelly is sharing what you make with your friends. The trouble is, you then have to make another brew because the cupboard is bare. But its an inexpensive and well appreciated gift. To me there is nothing better than a reminder of summer or autumn fruit in the form of a jelly with a scone or crossiant on a winter weekend morning. I wonder, since I have feijoas but no Red Cherry Guavas, if I might use plums or some other fruit to get a jelly with a nice red color. Anybody know? I am in California, and this is the season on feijoas here.